Boats on display at the San Diego Sunroad Marina Boat Show. 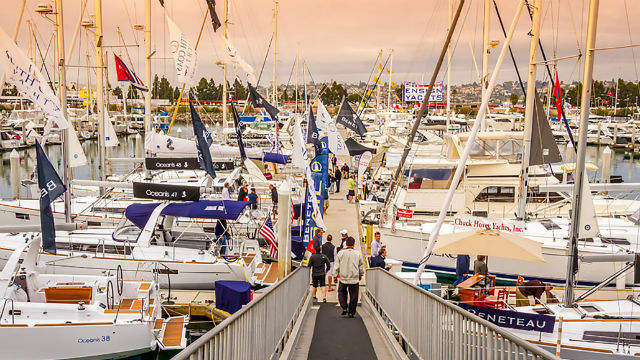 Over 200 sailboats and motor yachts of all sizes will be open to the public for four days at the annual San Diego Sunroad Marina Boat Show opening Thursday. Highlights include an $8 million, 82-foot-long luxury yacht, free boat rides, seminars, nautical products vendors and food nearby from Island Prime, Coasterra and C-Level. The show takes place at the Sunroad Resort Marina on Harbor Island and over 11,000 people are expected to attend. Show hours are noon to 6 p.m. on Thursday and Friday, and 10 a.m. to 6 p.m. on Saturday and Sunday. Basic admission is $15.